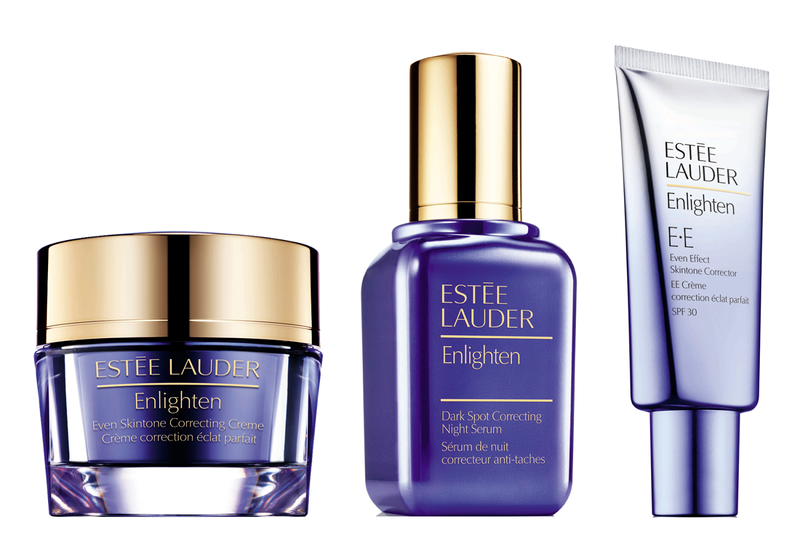 With the new Enlighten Skin Tone Correcting Collection Estee Lauder presents a new intelligent approach to beautiful, vivid and bright impeccably toned skin. The intensive care system from the leader in the repair night cream, is a quite amazing transformation process in motion. Starting point for the development of Enlighten was the recognition that harmful influences during the day lead to increased pigment formation during the night. S novou kolekciou Enlighten Skintone Correcting, Estée Lauder predstavuje nový inteligentný prístup k krásnej, živej, jasnej a dokonale tónovanej pokožke. Východiskovým bodom pre rozvoj Enlighten Skintone Correcting kolekcie bolo poznanie, že škodlivé vplyvy počas dňa vedú k zvýšenej tvorbe pigmentu počas noci. The comprehensive care system against all types of skin discolorations consists of three complementary products - Enlighten Dark Spot Correcting Serum Night, Even Skin Tone Correcting Cream and Even Effect (EYE) Skin Tone Corrector SPF 30th. A real transformation takes time. The Enlighten-Trio is a 24-hour care system that used together to maximize the impact and gradually changed the appearance of the skin. Komplexný systém starostlivosti proti všetkým typom pleti sfarbenie sa skladá z troch vzájomne sa doplňujúcich produktov - Enlighten Dark Spot Correcting Night Serum, Even Skintone Correcting Creme und Even Effect (EE) Skintone Corrector SPF 30. Skutočná transformácia nejakú dobu trvá. Enlighten Skintone Correcting trio je 24-hodinový systém starostlivosti, ktorého cieľom je maximalizovať vplyv, aby sa postupne zmenil vzhľad pokožky. Enlighten Dark Spot Correcting Night Serum prevents excessive pigmentation of the skin during the night and softens existing discoloration. Even Skintone Correcting Creme defends the skin every day against harmful influences. It protects against UV radiation, irritating effects of environmental and free radicals. Enlighten Dark Spot Correcting Night Serum zabraňuje nadmernej pigmentácii pokožky počas noci a zjemňuje existujúcu farbu. Even Skintone Correcting Creme bráni pokožku každý deň pred škodlivými vplyvmi. Chráni proti UV žiareniu, znečistenému prostrediu a voľnými radikálmi. This is really a good news from Estee Lauder. there are other brands with EE products? I do not know any. Only Estée Lauder. I am about to buy the advanced night repair serum, have heard wonders about it. hmm this sounds like a really great product! i didn't know that ee products have started rolling out now! Zvlastny clanok, posobi to na mna, ako keby si odpisala navod na skatulke. Skusala si vobec ten produkt? Neviem co si mam vlastne mysliet o tom clanku. really interesting stuff :) i love your little reviews - always after reading them i want to buy everything!